Turkish Corner opened at National Library in Islamabad to promote people-to-people relations between Pakistan and Turkey. ‘Turkish Corner’ was inaugurated in the National Library on Tuesday to help the researchers understand the Turkish culture as well as promote people-to-people relations between Pakistan and Turkey. Federal Secretary for National History and Literary Heritage Aamir Hasan and Turkish Ambassador Sadik Babur Girgin jointly inaugurated the corner. Speaking on the occasion, Turkish ambassador Sadik Babur Girgin said that Pakistan and Turkey enjoyed brotherly relations and people of both the countries were tied in the knot of love, brotherhood and mutual trust. The ambassador also said that Pakistanis are a great nation and Pakistani youth needed to have faith in themselves. He said that Pak-Turk diplomatic relations were deep and getting stronger by every passing day. Federal Secretary Aamir Hasan said that serious efforts were being carried out for upgrading the services of the National Library. He said that projects including digitization of the rare manuscripts besides introducing new facilities, including the Women Resource Centre, the children section, section for persons with disabilities, digital reading and dedicated facilities for professional groups were underway, for which 40 dedicated computer desks would be provided, he said. Meanwhile, theTurkish language department of National University of Modern Languages (NUML) on Tuesday hosted a lecture by Dr Azmi Ozcan on “Historical relations between the Ottoman Turkey and Subcontinent Muslims” in connection with 70th anniversary of the establishment of diplomatic relations between Turkey and Pakistan. 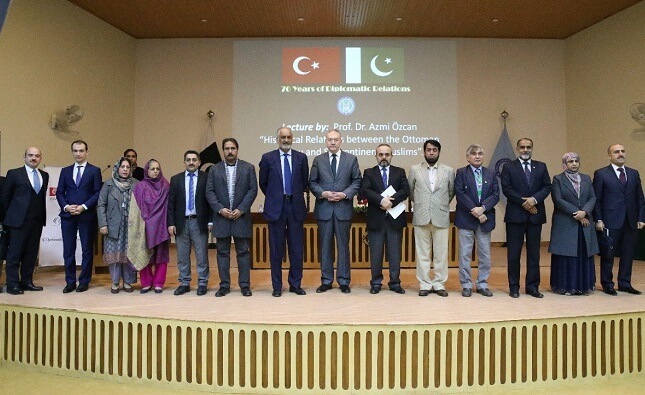 Turkish envoy Sadik Babur, Rector NUML Maj Gen (R) Zia Uddin Najam, Director General NUML Brig Muhammad Ibrahim, registrar, deans, directors, faculty members and students also attended the lecture. Dr Azmi Ozcan elaborated the struggle of renowned persons of the sub-continent for the Ottoman Empire. He said that Molana Shibli Nomani, Abu ul Kalam Azad and others played a key role in favour of the Ottoman Empire.